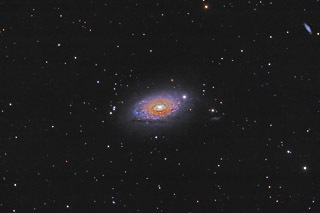 M63 is a beautiful spiral galaxy with amazing details in the spiral arms. M63 is part of a group of galaxies dominated by M51, the Whirlpool Galaxy. For a real treat, zoom on the enlarged image to see dozens of small, faint galaxies, particularly to the south and east of the galaxy. In this image, North is Up. This image is cropped to 76% of the original full frame. Software Used Images Plus 4.0 for camera control, calibration, stacking and digital development. Photoshop CS5 used for color correction, shadows and highlights, star shrinking, saturation adjustments, unsharp mask, screen mask invert, and high pass filter. Noise Ninja for noise reduction. Notes This is my longest exposure to date. M63 is such a beautiful galaxy, I'm glad I invested the time in it. I'll want to reimage this target once I have all my equipment issues resolved, as I think there's a whole lot more potential. I may reprocess this one, as I think I can improve on this now that I have a little better understanding of image processing.